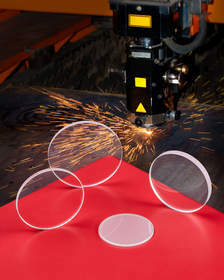 PROVIDENCE, RI--(Marketwired - Jun 17, 2015) - Laser Research Optics has introduced a line of sapphire windows designed for larger industrial cutting lasers from 4 kW and above that are highly durable replacements for debris shields. Available in 1" to 2" sizes, Laser Research Fiber Laser Sapphire Windows have a 10-5 scratch-dig finish, 1/4 wave flatness, A/R coatings on both sides, and provide > 99.5% transmission @ 1.07 microns, with > 90% @ 650-670 nm. Fused silica UV grade windows coated on one or two sides are also offered. Laser Research Fiber Laser Sapphire Windows are priced according to size and quantity. Introductory price quotations are available upon request. Laser Research Optics is a division of Meller Optics, Inc., a world leading manufacturer of hard crystalline materials such as ruby and sapphire since 1921. The company maintains one of the largest inventories of stock CO2 optics in the country. Available for immediate delivery, the optics are ideal for direct field replacement in low power CO2 lasers currently being used for laser marking, laser engraving, laser cutting, and low power scribing and welding. Reducing the typical number of lens changes, these fiber laser sapphire windows feature Moh 9 hardness which is second only to diamond.